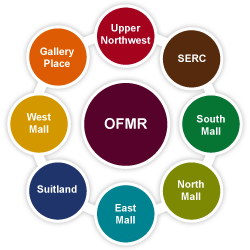 The OFMR Zones perform day-to-day facilities operations and maintenance services to ensure that the facilities are safe and clean for the collections, visitors and staff. These services include custodial, labor and utilities work, recycling, building maintenance and management, systems engineering, and administrative services. Zone Management accomplishes its work through in-house and contracted services. With such a large campus we geographically organize our facilities into eight zones. Below you can see all of the Smithsonian’s public facilities.